Authors: Carmen Lane and Daniel Martinko. Resource Description: There is a growing recognition that political economy analysis (PEA) is an essential aspect of external donor assistance to complex health reform processes. USAID’s Vision for Health Systems Strengthening (2015–2019), for example, recognizes that “broad political economy issues often drive health systems organization, priorities, and performance” and that “health system strengthening challenges are intertwined with political and economic considerations.” This information brief is for those designing and implementing health system programs to support in-country champions of health systems reforms. his brief provides a short synthesis of findings from selected project documentation, key informant interviews (KIIs), and case studies of how PEA has been used to inform donor programming in the field of health system strengthening—from project design to implementation and adaptive management from regular monitoring and evaluation. It also summarizes how PEA can help projects be more effective by being more aware of and responsive to local political realities or thinking and working politically (TWP). 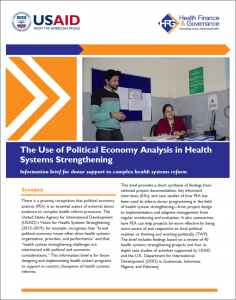 The brief includes findings based on a review of 40 health systems strengthening projects and four in-depth case studies of activities supported by USAID and the U.K. Department for International Development (DFID) in Guatemala, Indonesia, Nigeria, and Pakistan.